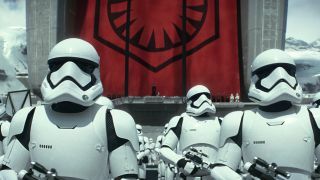 The First Order may have taken quite a beating at the end of Star Wars: The Force Awakens, but what doesn’t kill you makes you stronger, right? If by make you stronger, you mean unleash a couple of killer vehicular weapons in Star Wars: The Last Jedi that is. Check out the baddies’ new answer to the AT-AT and Super Star Destroyer below. Star Wars’ very own YouTube channel has the scoop (obviously?) on the First Order’s duo of deadly mech… weapon… ship… things. And they’ve even taken design tips from the original trilogy, because even evil space tyrants are lazy sometimes. First up, we have the AT-M6, differing from its AT-AT cousin because of the M6 (Megacalibre Six) laser cannon on its back. It also moves faster than the lumbering AT-ATs first featured in Star Wars: The Empire Strikes Back. So at least they’ve learned from their mistakes. However, that looks like a pussycat next to the 25,000-foot First Order Dreadnought. There’s guns galore (including two orbital cannons which could quickly level a fleet) and it’s really, really big. There’s not much more to say without just saying ‘GUNS!’ over and over, so check it out below. And maybe we’ve already seen its handiwork if it has something to do with whatever exploded in that Star Wars: The Last Jedi image. Want more Star Wars: The Last Jedi news? Check out whether a Star Wars toy revealed some brand-new Snoke and Kylo Ren dialogue and why stamps - yes, stamps - give us the closest look at Snoke yet.